Events in Hampshire in April and May. Springtime is here, now is the time to be out and about!!! There may still be frost on the ground and in the trees sparkling in the sun. There may be April showers. Soft English sunshine and fluffy clouds. Springtime calls to us all. New Forest Spring Sportive 13th and 14th April 2019. Quiet forest roads in the lovely New Forest. Book early for this one it gets popular. Venue: Somerley House, Ringwood. Heavy Horse Event 2019 TBC at Harbridge Farm, Ringwood. There will be Heavy Horses working the land, wagon rides, horses ridden and driven, wagon rides, ring displays and more. Petersfield Beer and Cider Festival 26th and 27th April 2019. Petersfield Festival Hall. Good local Real Ale, Lager and Cider, Good Music, Good Food. An unbeatable combination! Alton Walking Festival Week 1st May to 31st May 2019 Was just a weekend, then it was a week, now it is so popular it is a month! Winchester Chamber Music Festival 3rd to 6th May 2019. Several venues. The Hampshire Hilly Hundred. 19th May 2019. Sparsholt College, Sparsholt. 100 miles of near traffic free sportive cycling. There is a shorter course of 75 miles. Alresford Watercress Festival This Food Festival is a 'street party' in the centre of Alresford showcasing this good for you, versatile and delicious vegetable. Not just watercress either! Will be held on 19th May 2019. Lymington is a really lovely place on the edge of both the New Forest and The Solent. As such it is a popular tourist area. Walk down Quay Hill and Quay St. Do not forget the camera! Lymington has a car ferry to The Isle of Wight. Fareham is in south east Hampshire, not far from either Southampton or Portsmouth. It is a quiet market town perhaps but those lovely old buildings in the High Street have some great restaurants. Fareham Council are pretty go ahead and the town centre has been modernised. 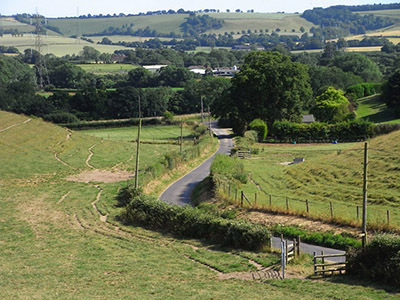 The Meon Valley is an attractive area. The pretty villages of East Meon and West Meon are on the headwaters of the Meon River. The River Meon itself is a Hampshire chalk stream that flows down to The Solent. Brockenhurst is actually a large, attractive village not a town and is surrounded by one of the most beautiful areas of the world, The New Forest. 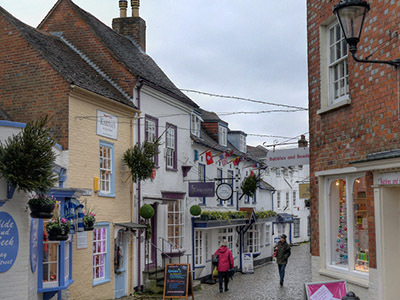 Ringwood is such a popular small traditional market town that it is a bit expensive to live there! Not surprising. It is close to the New Forest and Bournemouth. Ringwood has had a brewery for many years! Romsey too is a pleasant market town. Set in the famous Test Valley. Visit Romsey Abbey. Timsbury is not far from Romsey, also in the Test Valley. Has a lot of listed buildings. Winchester is the capital of Hampshire today, home of Winchester Cathedral, King Alfred's statue and many more interesting places. 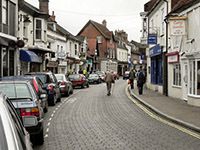 The Upper High Street is mostly for pedestrians and a good shopping area. St Lawrence Church can be found near the Butter Cross hidden away in the archway of the Square. The Square makes a good place for an alfresco lunch on a nice day. Alresford is of course famous for its watercress grown on the clear chalk streams of the River Itchen. Also famous for the Watercress Line, a railway that runs between the town and Alton. Or you may like to browse some more, please do, the navigation buttons are above and on the left.